A gorgeous made to order bracelet, you choose the gemstones for your custom bracelet and select gold or 925 silver. This is not one of those light weight bracelets that flood the jewelry markets so, please evaluate the price based on the features explained in this report. We have designed this bracelet to provide a touch of luxury on your wrist, skilled artisans work on every single detail. Rising precious metal prices have encouraged jewelers to craft jewelry with insufficient metal weight. A light weight bracelet cannot withstand frequent wear for very long, the piece will snap or fall apart after a while. Most jewelers would be glad to make the BRC10N custom bracelet, with a weight of around 8 to 10 grams. We provide a healthy gold weight of around 20-25 grams and a silver weight of 18-20 grams, this makes the bracelet long lasting. 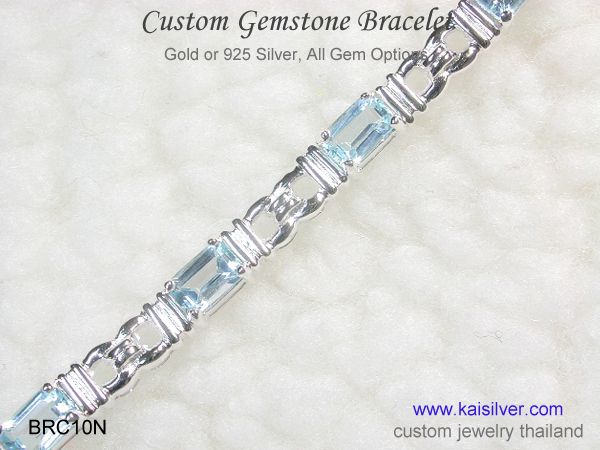 It is customary today for colored gemstones to steal the show in any jewel, made to order bracelets from Kaisilver are no different. Depending on the length that you choose for the bracelet, you would have 7 to 8 octagonal gems measuring 7x5mm. You could choose the gemstone of your choice and also, request for different gems to be combined in the same 925 sterling silver or gold bracelet. The concept of a family birthstone jewel is easily accomplished with this multi gemstone bracelet. You could pick the gems based on the birthdates of all family members. We can work out a price quote based on the gems that you choose, you need not limit your gem selection to what is mentioned on our website. Jewelry with rectangular gemstones always appears to be trendy and stylish, the quality of the bracelet would make it perfect for all occasions both, formal and informal. With the same set of fine artisans and gem experts working on gold and silver bracelets, we maintain the same quality standards for both metals. 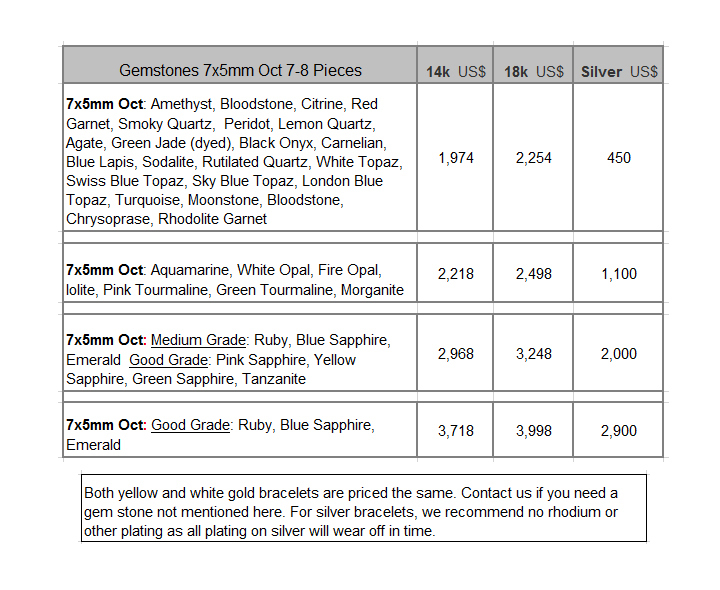 You can order an 18k or 14k custom made bracelet and request for white, yellow or rose gold. While we do provide white rhodium, yellow gold and pink gold plating options for the made to order 925 silver gemstone bracelet, we will suggest that the bracelet be left un-plated. This is because, no plating on silver is permanent – the plating will wear off after a while. If you still prefer to have your custom silver bracelet plated, let us know and we will fulfill your request. Available in 14k or 18k white, yellow or pink gold and in 925 sterling silver. The same quality standards for workmanship and gemstones for both metals. The custom gold gemstone bracelet has a weight of around 20-25 grams. The weight of the made to order 925 silver bracelet is around 15-20 grams. The BRC10N bracelet has 7-8 gemstones size, 7x5mm octagonal. You can choose the gems and also choose to mix different gems in the bracelet. Each bracelet is fully custom made, design modifications can be accommodated. We can custom make your bracelet with design specifications provided by you. How To Buy: Do not be in a rush to place your order and make a payment, the quick ‘click and pay’ process is really not suitable for high end jewelry purchases. Get in touch with your team at sales@kaisilver.com and let them know what you need. Since each jewel is completely made to order, you will be informed of any options that are available for your requirement. Once you have all the details, move to the purchase process. Payment is accepted through Paypal and Western Union but, we suggest Paypal for first time buyers. You can let us know which is your preferred mode of payment and we will provide details for the same. Since each jewel is custom made and not crafted with existing molds and blocks, we require a 4 to 6 week production time from the date that we receive payment. Shipping is through FEDEX with web tracking, we generally bear the 35 U.S$ shipping charge but, this might not always be possible. 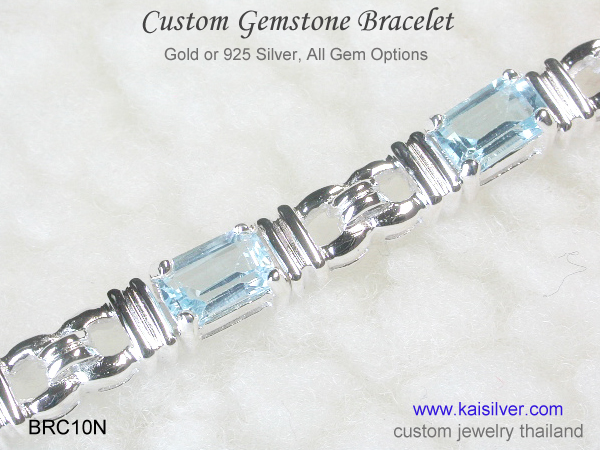 Kaisilver: With over 7,000 discerning gem and jewelry clients spread across the globe, we are the leading online custom made jewelry provider. We craft high end gold and sterling silver jewelry with our designs or yours. Preferential access to over 200 million carats of rough and polished gems, allows us to place no restrictions on your choice of gemstones. 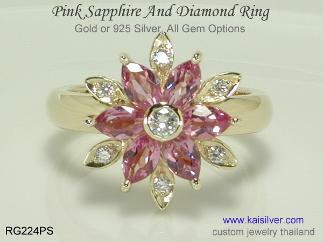 Our support experts at sales@kaisilver.com will be glad to help you, with any requirements that you might have related to gems and jewelry.